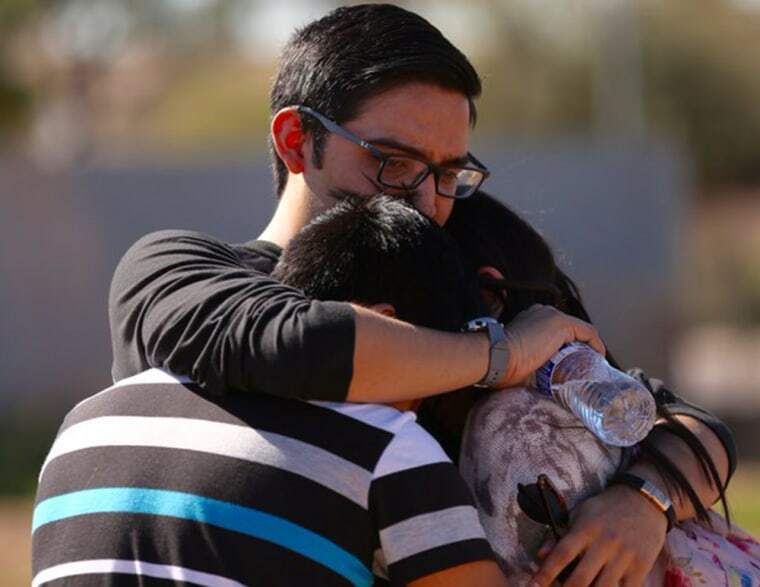 The shooting deaths of two close friends at an Arizona high school Friday morning appears to have been a murder-suicide, police said. The two 15-year-old Independence High School sophomores were not identified by police. Their bodies were found near the cafeteria after a shooting was reported at the high school just before 8 a.m., police said. Glendale police said investigators believe one girl fatally shot the other and then killed herself. A suicide note was found at the scene, police said. "During the processing of the scene, a suicide note was located," police said in a statement. "Information gathered by detectives reveal the two girls were very close friends, appearing to also be in a relationship." Each girl suffered one gunshot wound and a firearm was found at the scene, police said. Gunshots were heard but it doesn’t appear any other students witnessed the shooting, police said. The shooting led police to lock down the school of around 2,000. "Our hearts and minds are with the families who lost children today. We offer our deepest condolences,” Independence Principal Rob Ambrose said in a letter to parents. Social workers will be at the high school Saturday as well as next week to help students and family members, the school district said. "Our heartfelt sympathies go out to the families and friends of these two girls," Glendale Mayor Jerry Weiers said in a statement.